tocExpert | Does TOC have the tools and mindset to understand the benefits to the customer? Does TOC have the tools and mindset to understand the benefits to the customer? I was surprised to learn that there is such perception at all. This statement made me realize that there must be quite a gap in the knowledge and/or interpretation of TOC concepts, tools and techniques among the TOC community. And probably not only in this area. Let’s take the claim that TOC has ‘the wrong mindset’ in regard to understanding the benefits to the CUSTOMER (as opposed to the BUSINESS – theirs and ours). Let’s assume that by “CUSTOMER” Richard meant not a company that is a customer for the TOC solution (because otherwise it would be a BUSINESS), but the final customer, the one that uses the product (any type of product). TOC has a very strong mindset about creating for a BUSINESS a DCE – Decisive Competitive Edge. A Competitive Edge can be created ONLY by keeping the benefits to the CUSTOMER as the central element, the focus and the main drive of the solution. The benefit to OUR business (as the product provider) comes ONLY AS THE BY-PRODUCT of recognizing and finding how to create the benefits to our CUSTOMER. ALL logistical solutions were created AS THE ANSWER TO THE NEED TO CREATE THE BENEFITS TO THE CUSTOMER. What is the whole sense of MTA (Make to Availbility) and DTA (Distribute to Availability)? 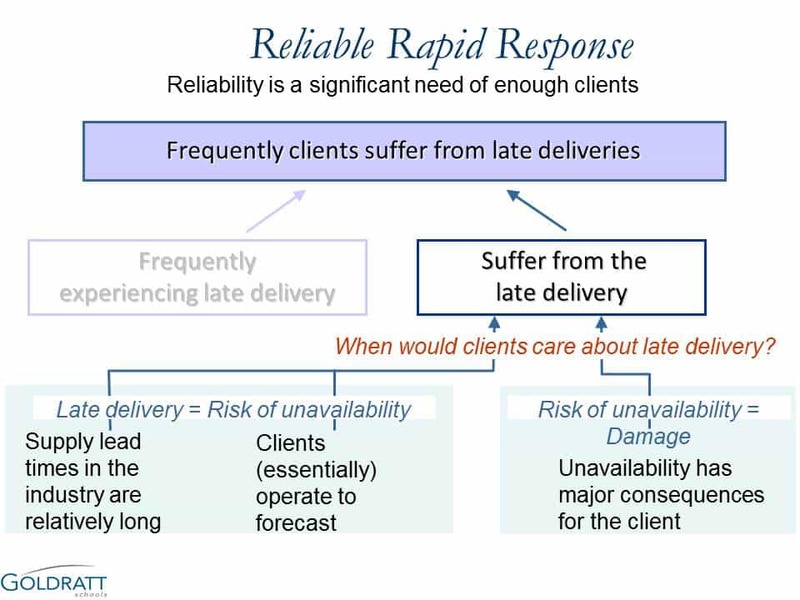 What is the meaning of creating availability if not a CUSTOMER BENEFIT? If the availability does not create benefits to the final customer, how can a company built for itself a decisive competitive edge through maintaining availability? MTO (Make to Order) – is all about creating the benefit to a customer of stopping the customer’s pain due to late deliveries from vendors. Here is a print screen from the RRR (Reliable Rapid Response) Template, one of Viable Vision templates. The print screen is from Goldratt Schools materials of the VV times. In a clear, concise and very explicit way it demonstrates that the benefit to the CUSTOMER is in the center of the whole solution. It also demonstrates a very clear logical sequence how to come to the UNDERSTANDING OF CUSTOMER BENEFIT. All TOC templates are built according to the BENEFIT TO THE CUSTOMER. In 2004-2010 all VV templates were taught by the extensive faculty of Goldratt Schools in Application Expert Programs (AEPs) to hundreds of TOC practitioners, and later on in various educational programs throughout the world. The claim that TOC does not have the mindset (or has the ‘wrong mindset’) to understand the benefit to the CUSTOMER is simply NOT CORRECT. Now – what about the TOOLS? This is in reference to the claim that “TOC does not have the tools to understand the benefits to the CUSTOMER”. This is also not correct. The print screen above is a very explicit example of one of the tools to use. There is also a big block of TOC TP (Thinking Processes): the customer’s UDEs, UDE Clouds, the CRT, the assumptions, the injections, the NBRs, the FRT, a structure of the S&T step. I have been very successfully using Thinking Processes working with retail companies to help them develop breakthrough solutions for their customers (the end customers, the ones that come in the shop to buy) through understanding the benefits TO THEIR CUSTOMERS. How do I know that the benefit to the customer HAS BEEN created as the result of this work? Through the direct and explicit financial result from each solution that has been implemented. If we had not understood the benefit to the CUSTOMER, the customers would not have responded to the new solutions by bringing their money in return to the product or service. The bottom line – TOC DOES have the mindset and the tools to understand the benefit to the customer and to create solutions that delight the customer and financially benefit the business. It is just the matter of getting the relevant knowledge. Dr.Goldratt quoted from the research by Ernest&Young, No.1 reason for the end users/consumers to pay more and make the decision to buy is: availability. That’s why 3 dynamics are getting stronger and stronger to influence the supply chain: the variety of individual needs of the consumers to get product range wider and wider ; the tolerance time to wait is almost zero; the product life is getting even shorter than the supply time.